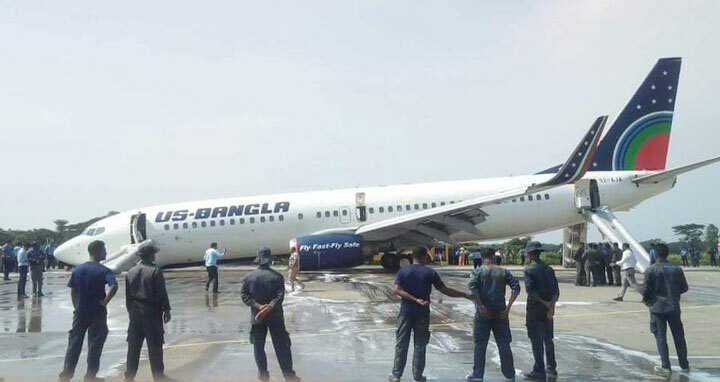 Dhaka, 26 September, Abnews: An aircraft of US-Bangla Airlines narrowly escaped an accident as it was forced to make an emergency landing at Shah Amanat International Airport in Chattogram due to its non-functional nose gear. The aircraft with 164 passengers, including 11 children, on board made an emergency landing at the airport at 1:20 pm, said Shah Amanat International Airport Manager Wing Commander Sarowar-e-Azam. General Manager (Marketing Support and PR) of US-Bangla Airlines Kamrul Islam said a Cox’s Bazar-bound flight of US-Bangla Airlines – BS-141 took off from the airport in Dhaka at 11:30 am. As a technical glitch developed, the flight made an emergency landing at Shah Amanat International Airport as there was no facility of making emergency landing at Cox's Bazar Airport, he said. However, there was no casualty in the incident, Kamrul said. The nose gear of the aircraft was not working due to technical glitch and it flew in Chattogram sky for some time before landing at Shah Amanat International Airport, he added. The runway of the airport was shut after the emergency landing but the aircraft was removed from the runway using a crane, he said.